It's first thing Monday morning. The temperature is 35 degrees, the wind at Frawley Stadium is howling off the neighboring Christina River at 25 miles per hour and the Blue Rocks's new stadium operations manager is on a ladder trying to repair the broken Pivot PT Picnic Patio sign. Never has the old cliché that one person's nightmare is another's dream rung more true. Zach Chatman says despite the fact that he hates the cold and isn't too keen on heights, he's loving every single second of the task. 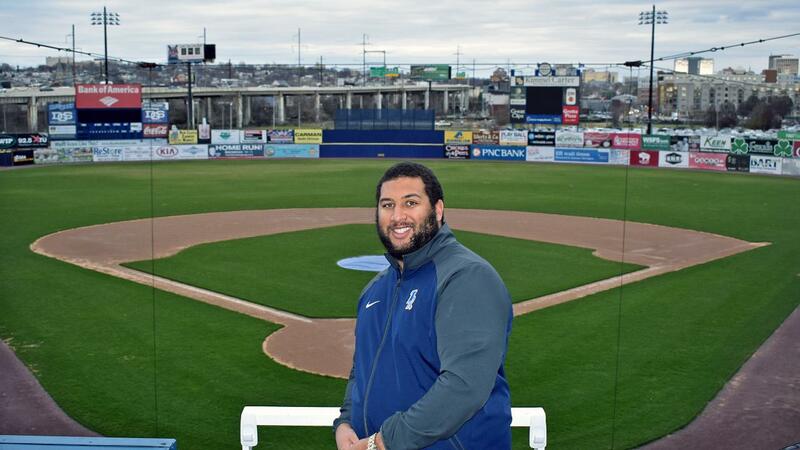 The 24-year-old Pennsburg, Pennsylvania native is in charge of taking care of Frawley Stadium, the 26-year-old home to the Wilmington Blue Rocks. It is a tall task that requires a strong work ethic and meticulous attention to detail - two traits instilled in Chatman growing up as a football player. Standing 6-foot-2 and closing in on 300 pounds, Chatman was a Montgomery County All Star on both the offensive and defensive lines in high school. He continued his career in college, playing at nearby Widener University. "Football taught me so much about life," Chatman says. "I learned to manage my time well, how to work with other people, about the importance of being on time and how to overcome adversity every day." It turned out all these little things that he thought the coaches were stressing in order to win football games were actually teaching him valuable life lessons. They became even more vital when Chatman's sights started to gaze beyond the sport he loved to the path his professional life would follow. "I've always wanted to work in sports," Chatman says. "Growing up, the dream was to play in the NFL. When I got to Widener I started to think past playing the game for a living and look more towards being involved in the business side of sports. I like taking care of things and thought operations would make a lot of sense. Suddenly that became the new dream." But the sports industry is not an easy one to break into. Often your course is littered with detours. After graduation, Chatman found his first. His best job offer was a seasonal position with the Blue Rocks in the team's community affairs department. His primary tasks were mascot appearances and helping director Kevin Linton coordinate the organization's charitable and community outreach programs. However, he was always open to doing more. If someone needed help, Chatman was the first to volunteer. If something needed to be fixed, he was there to help. He returned to the community affairs department for a second season in 2018, but added coordinating the stadium sound system and helping general manager Andrew Layman and client services manager Liz Welch install all stadium signage to his portfolio. Chatman's work ethic caught Layman's attention. The Blue Rocks general manager has been in charge of stadium operations for almost a quarter century. He now has a 11-year-old son, but for more than a decade his only baby was Frawley Stadium. He knows every crevice and crack in the ballpark and has spent many a late night tending to its needs. But when Layman became general manager shortly before the 2017 season, stadium operations went from his primary responsibility to a small piece of the jigsaw puzzle that was his new ever-demanding schedule. Yet Layman was reticent to relinquish the day-to-day care of his first baby. There were no obvious candidates to take over on the full-time front office staff and he wasn't keen on handing the reins over to a stranger. Slowly but steadily, Chatman's eagerness to learn and take on almost any task opened Layman's mind. Here was a potential protégé he could trust the care of his ballpark to. "Zach is a special young man," Layman says. "There's nothing he won't do to help this organization. His work ethic is exceptional and he treats everyone with kindness and respect. He also attacks every task. Because of that, even when he's still learning what to do, you know he will eventually figure it out. We feel very fortunate to have him be part of the organization." For his part, Chatman feels fortunate for the opportunity to learn from Layman and work for an organization and a man that have grown to mean a lot to him. "It was a humbling feeling that Andrew picked myself to assist him in the day-to-day care of Frawley Stadium," Chatman says with a prideful smile etched on his face. "It shows that he has faith in me, that I will get the job done to the high standard that is expected. Everybody at the Blue Rocks knows how much this place means to him and how much work he has put into it. That was a pretty special feeling to know I had earned his trust. I love it here and am very excited to be a part of the Blue Rocks family."